With a stunning spectrum of theater miniaturists from around the world, around the country and around the block, Great Small Works celebrates the revival of the nearly-extinct, intricate 19th Century theatrical form of toy (or “paper”) theater. A wonderful array of new, experimental and traditional toy theater productions take over all of St. Ann’s Warehouse for ten days, with miniature performance arenas in every corner, toy theater workshops for all ages, and a Temporary Toy Theater Museum with exhibits of historic, vintage and contemporary toy stages throughout the Warehouse. 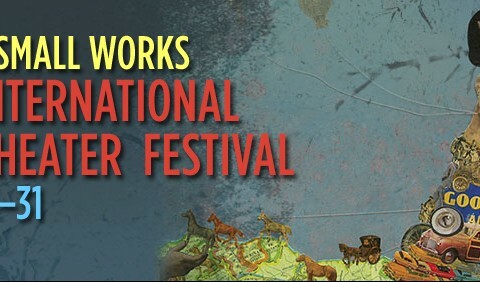 The festival will host Paul Zaloom and Lynn Jeffries (LA), Peter Schumann of Bread and Puppet Theater (VT), Janie Geiser (LA), Alejandro Benitez and Ana Martinez (Mexico City), Frank Maugeri of Redmoon Theater and Seth Bockley(Chicago), Hanne Tierney and Gautam Dasgupta (NYC), students from California Institute of the Arts (LA), Ravi Gopalan Nair and Parvathy Baul (Kerala, India), Peter Schauerte-Luke (Germany), Alain Lecucq (France), Laura Heit (LA), Shoddy Puppet Co. (Philadelphia), Puppeteers Cooperative (Boston and NYC), Cosmic Bicycle Theater (NYC), Great Small Works and many more. [Great Small Works has] breathed new, pointed life into the form of toy theater.